﻿ Areca Lodge Hotel, Pattaya | FROM $35 - SAVE ON AGODA! "Great location just 10 minutes from beach and away from the..."
Have a question for Areca Lodge Hotel? "Again had a very enjoyable stay in one of the Luxury Family rooms." "This was a great hotel all in all, there was shops pubs clubs right outside." A central and convenient location, along with great value, has made this property a popular choice in lively Pattaya. Most guests who choose to stay at the well-managed Areca Lodge Hotel will probably have designs on exploring the city’s acclaimed bar and entertainment scene and shopping areas, but those who choose to stick close to the hotel will be rewarded with a surprisingly quiet time amidst two large pools with Jacuzzis and other amenities including a fitness center, sauna, and on-site eateries. All rooms have balconies, so if you choose to soak up the local atmosphere from the privacy of your own room, that option is available as well. Areca Lodge Hotel can be easily booked with our secure online booking form. Simply enter your dates and click to proceed. "Great location, big pool, big clean room with power shower"
Hi, I have stayed there for 2 nights, and they gave me room where the sink was getting chocked, they didn't changed my room even after few requests, so stayed in same room. Besides, swimming pool is on the terrace and very small. Also, tea and coffee in the room wasn't complimentary. Have to pay even for this, the hotel staff gets into argument for this, then I left it as it was just a matter of tea which I can even get it on paid room service too. On 2nd day, after they done cleaning my room, they forget to put 2 complimentary water bottles, which is already included in hotel room rental, when I asked the reception to send it, they asked me that their room service personnel is not available now, and if I want it now, I can come down to reception to collectit. This is so embarassing! I've stayed at the Areca lodge many times over five years. I was disappointed that this trip Agoda's usual "Pay in Advance" option was not available. Between my September booking and my travel the my price in dollars increased by 8%, or so. Of course the price in Baht was unchanged when I paid at hotel. I much prefer prepaying Agoda's price in dollars using a US bank. I hope the hotel, and Agoda, will be offering this for my next stay. We have stayed at this hotel in center pattaya for many years . It’ could do with an upgrade,, rooms are starting to look a bit shappy, but they are busy with it!. Brand new restaurant & seating area at the front- Marble. Great food. And they were also busy with a few of the rooms. Location wise still a winner. Center pattaya yet no noise from any of the bars. Couldn't fault this hotel. Will be staying there again in August and I cant wait. Guest friendly which I loved the best. Also arrived 7 hours late (3.00 am) and the staff made sure that the check in was done quickly so I could get to my room and sleep. For years we have stayed here several times a year we won’t be going back. Staff just doesn’t care are not friendly, pool staff are the worst. Fitness center equipment is broken for years now. Great pools, decent buffet breakfast good location, beds are hard. Nice place. Very good breakfast. Two big pools. The room very clean and well maintained. Staff really helpful. Had everything I needed. Not bad hotel. The outside restaurant is nice if you are at the pool or in the morning , but if you want to cool off in afternoon or evening , its a little hot. Great food though. The air conditioner is a large unit on the balcony which blows hot air and is noisy so not very comfortable to sit on the balcony. But other wise room was clean, bed very comfortable, had all the things I needed . Great location right in the middle of everything. Easy to walk to places. My stay at Areca Lodge was wonderful. Receptionists were great. Smiling and helpful. As you walk through the building all staff greet you with a smile and a sawadee ka or sawadee krup. Room was great with nice balcony. Breakfast was really good with very efficient staff. Pool was nice and enjoyed a couple of drinks at the pool bar. Location was really good and very close to bars and restaurants. Hotel is guest friendly. I really enjoyed my stay and will definately stay again. Thank you Areca. This was my 3rd or 4th stayed at Areca. Location was good, not near the beach, so no sea view but very convenient and peaceful even in the middle of the night life area. Loved best the 2 pools but gym need upgrade. Room was well maintained and very good housekeeping. 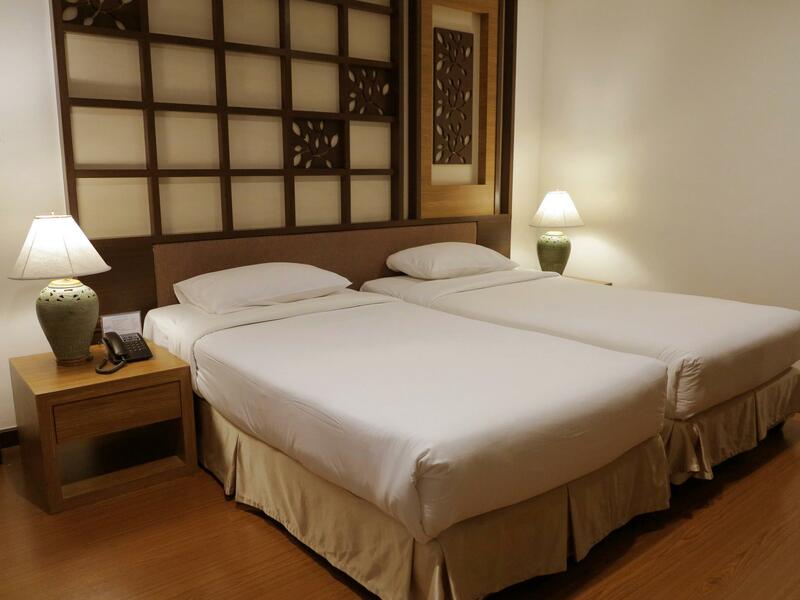 Room space adequate and comfortable, bed and pillows also comfortable. Housekeeper and restaurant staff were efficient and friendly but front desk staff need retraining or even better if change. The middle age woman that check me in was efficient but very cold and unfriendly, my room was paid in advance and ok for me if they need a thousand deposit but they refused my credit card without an explanation and needed cash. I just arrived and tired, not sure if I’ve enough cash but lucky found the money I needed, but if I’ve not prepaid the booking and with that cold attitude, I’ll walkout and check in another hotel nearby. But the front desk staff that check me out was nice, friendly and efficient with excellent communication skill. My second stay at this establishment and I went back because of how much I enjoyed the first stay. There was/is construction on-going at the establishment, but it did not disturb me or cause any inconvenience to me. The staff was very accommodating with check-in and check-out. This location is excellent for restaurants and the nightlife Pattaya has to offer, it is located in the heart of the LK Metro area, and not far from the famous Walking Street. If you like walking, it is a nice walk to and from there, but I would recommend either catching a taxi scooter (conveniently located right outside this hotel) or walk to the main Soi and catch the baht bus. This hotel is excellent for a group getaway and solo vacationers. I hope you enjoy your stay there as much as I did. The list of pros for hotel is almost everything, easier to list the few cons: WiFi was spotty had to pay for other access for reliable connection. The pool is large and clean, able to swim laps. Kiddy pool is big too . .o.. While the rooms are showing some wear and tear and the bathrooms could use an update the location is really, really great, the staff were very friendly and professional and the pools and other services were great. I can see why people seem to come back here year after year. I know I will. Excellent staff! I stayed at evergreen building, there was very quiet that I could sleep very well. Shower turned hot immediately. Small ants walked around the floor, so it is better not to eat in the room, otherwise your food would be destroyed. I could go to everywhere in very cheap price. Quite and just a short walk to the action, however they they will give you only 1 room key even when there’re 2 registered guests which was an inconvenience during a vacation. For this reason I would only rebook if traveling solo. Arrived at reception and was checked in very quickly given a welcome drink. Shown to my room in the new block where I have stayed twice before . Room 2314 a pool room view a smaller balcony than the others on that floor but suffices enough room for a smoker . Room was spotless and the old complaint about bath / shower will still go on . Staff always acknowledge you weither its a cleaner or the hotel manager . Breakfast is great plenty to choose from either Western food or Thai the egg station was excellent best omelette I've tasted ever . Pool areas are great too plenty of sunbeds and towels can be had The Areca is located in the centre of Soi Diana with nearby beer bars , restaurants ,shops mini marts etc and food stalls are abundant . This was my 7th stay at this hotel and wont be my last. This is the second time I have stayed here and would be happy to stay again. great breakfast, fantastic pools and location. Walking distance to anywhere you would like to go. If not, a short walk to a baht bus.